Here are a couple example of the quality work we do. 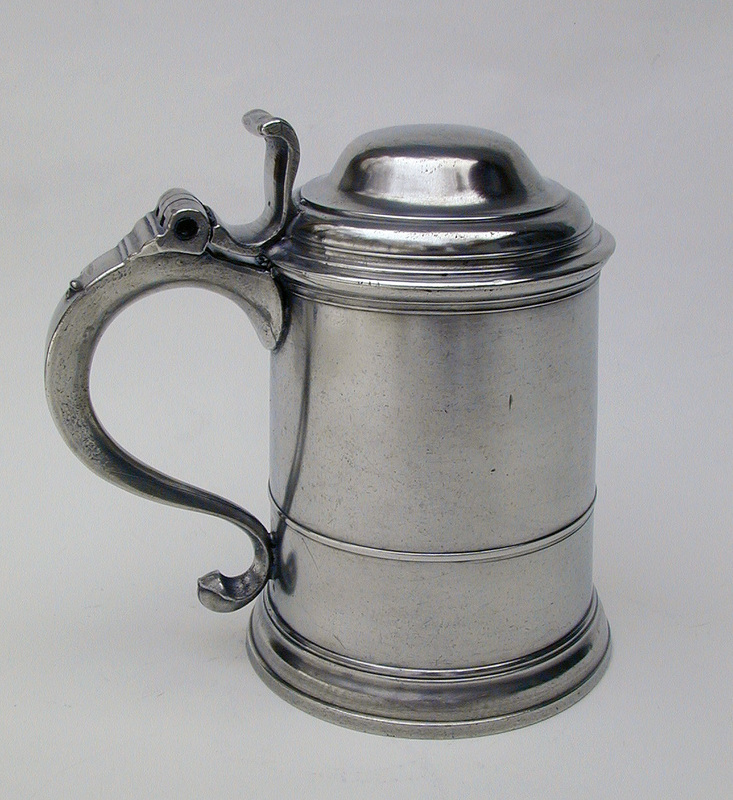 I recently restored this tankard. The severity of the damage is quite clear from the "before" photos. 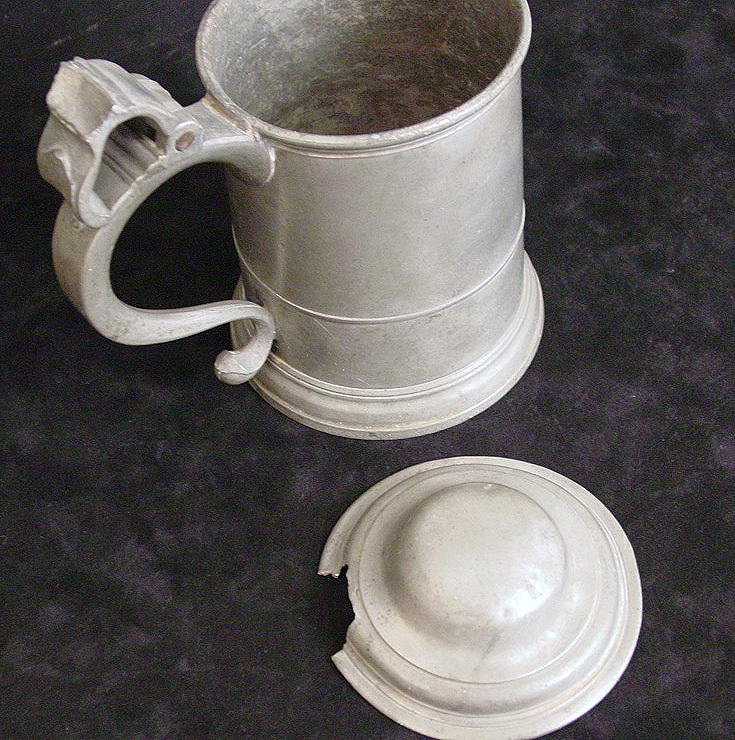 This tankard came to us with it's lid torn off. 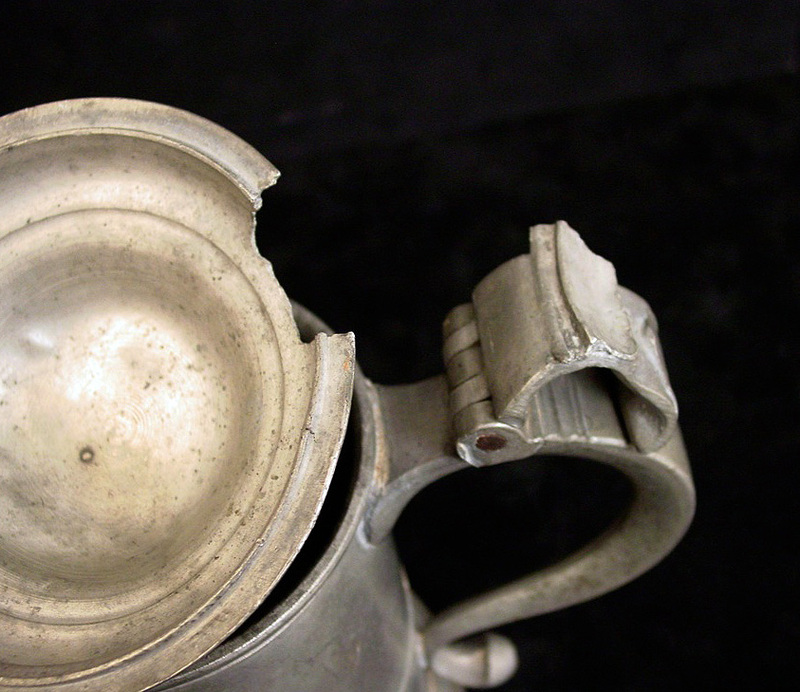 Apparently the tankard had been dropped and bent the lid back severely. A well meaning individual attempted to return the lid to it's original position and by doing this improperly, broke the lid from the thumbpiece. 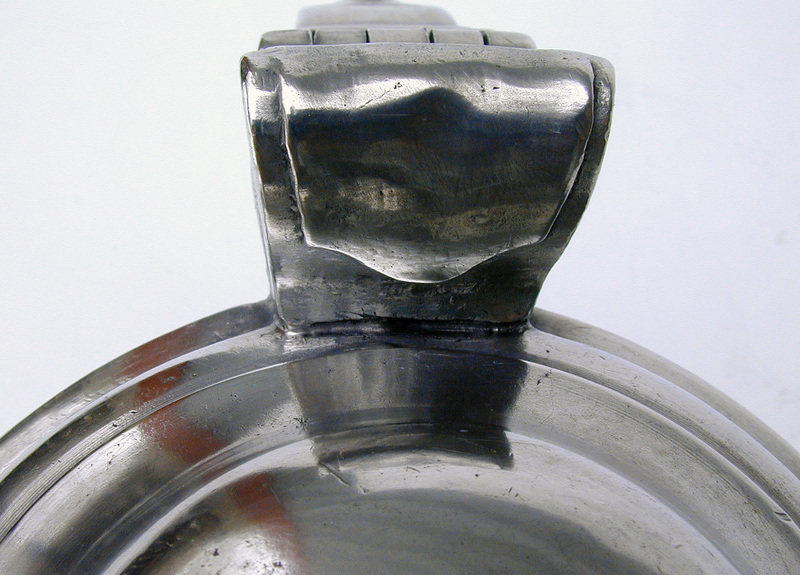 Note a small portion of the lid remains attached to the thumbpiece. A very careful restoration was done to reattach the lid to the thumbpiece. First the tankard body and lid were "straightened" to their original configuration. This allowed for the lid to line up perfectly with the remain portion on the thumbpiece. Matching metal was welded to the break from the inside of the lid melting it through to the outside around the thumbpiece. 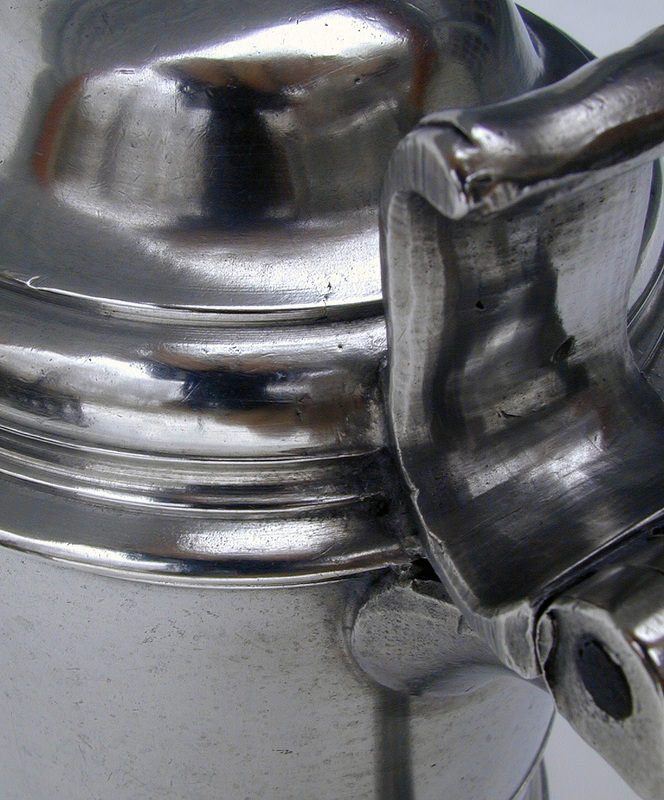 The welds were carefully taken down to match the contours of the original surface. 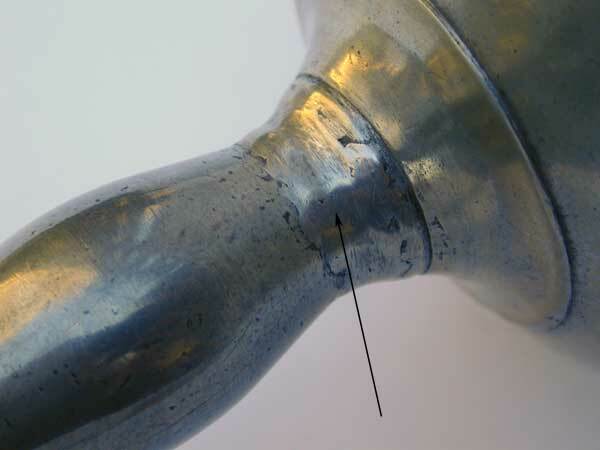 After this highly involved shaping, the joint between the thumbpiece and lid were "sweat-soldered" as originally done to complete the bond between the lid and thumbpiece. It should be noted that the lid at the moldings was turned rather thinly increasing the difficulty of this restoration. 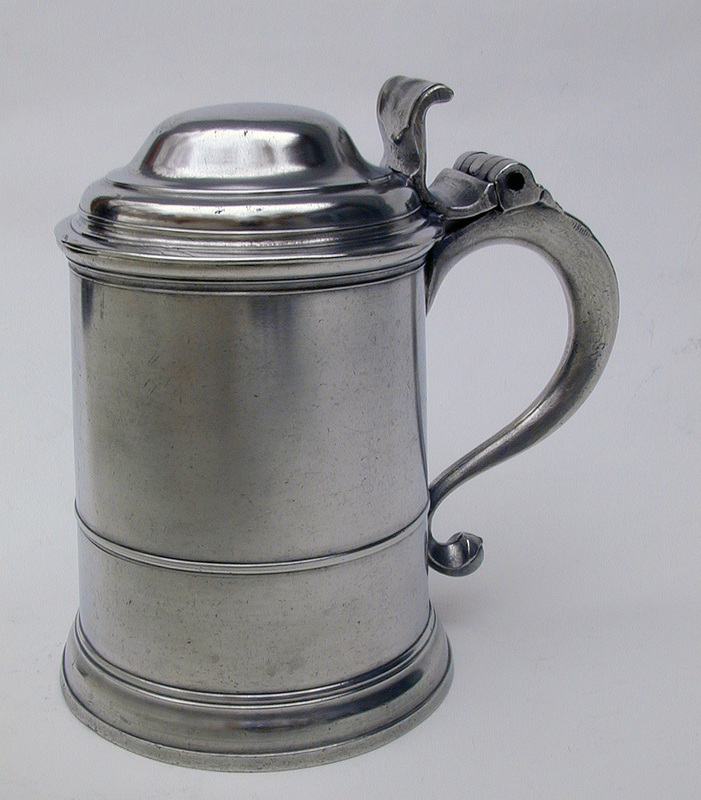 After duplicating lathe marks and a careful "aging" to match the "age" and "use" marks of the surrounding surfaces, the tankard was hand polished. The finished product, "saved" an important example of an 18th century English Export tankard for future generations to enjoy. 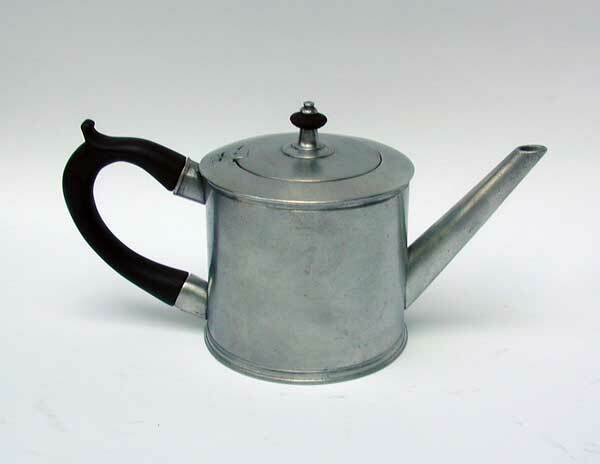 This photo is of a "drum-form" English Export teapot. 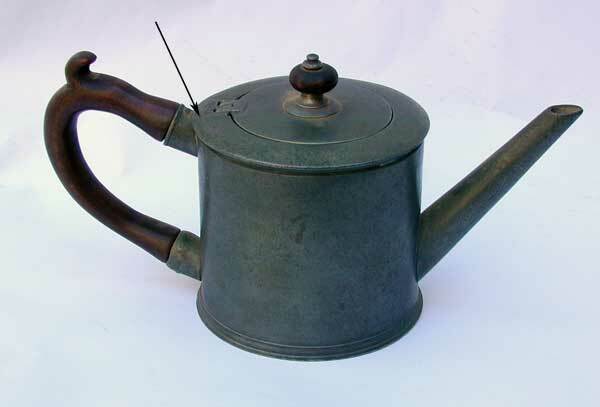 This teapot had an improperly restored handle and finial button along with several old metal repairs that needed to be corrected. After careful cleaning and repair of crack (arrow), a correct handle, copied from a period handle on another "drum-form" Export teapot, was hand craved from native cherry. This wood has strikingly similar characteristics to the fruitwood typically found with period handles on Export teapots. 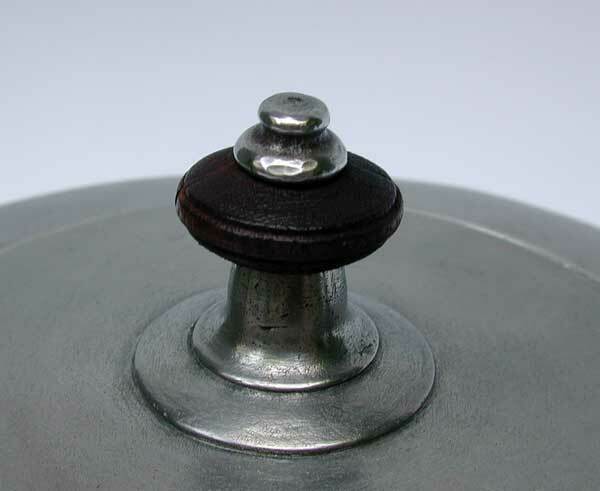 A wood button was turned to match an original period button, as found on a "drum-form" teapot by another Exporter. 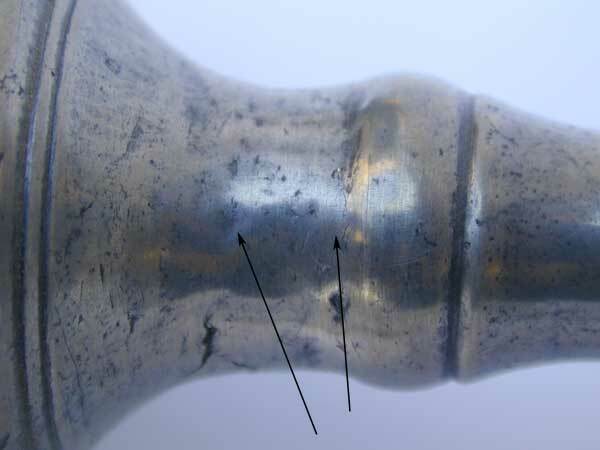 The arrow shows a crack on the surface of the upper edge, that was subsequently restored. This shows the teapot as completed the handle is a faithful copy of a handle found on another period "drum-form" Export teapot. The handle was "aged" to approximate the look of 200-year-old wood. The crack on the upper edge has been restored and is invisible to the naked eye. The wood button is a copy of an original found on another "drum-form" Export Teapot. The button was "aged" to approximate the look of 200 year old wood. Another example of our work is an unmarked Philadelphia Chalice attributed with confidence to William Will. The arrows indicate areas of damage. Note that the chalice has a bent foot and the cup leans to the right. 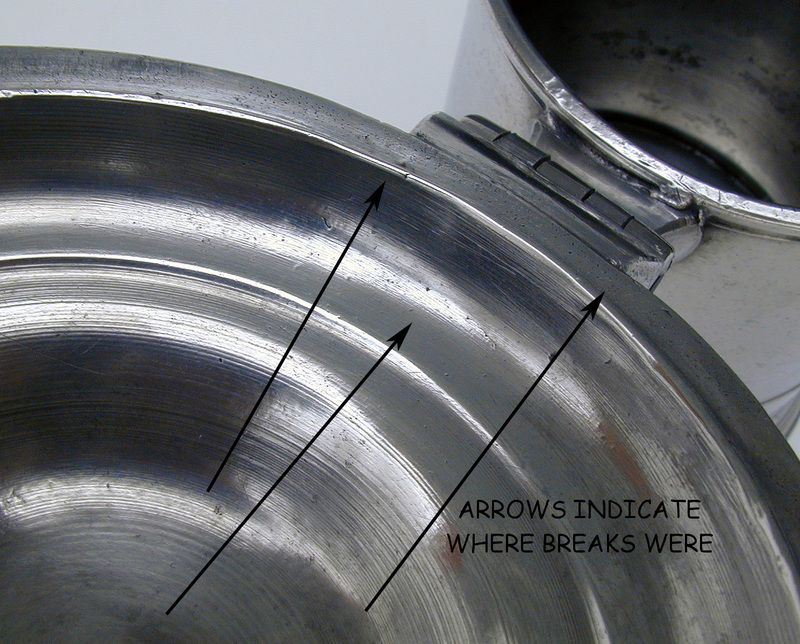 Here are two close-ups of the damage to the shaft. The patches held the piece together thereby "saving" it. 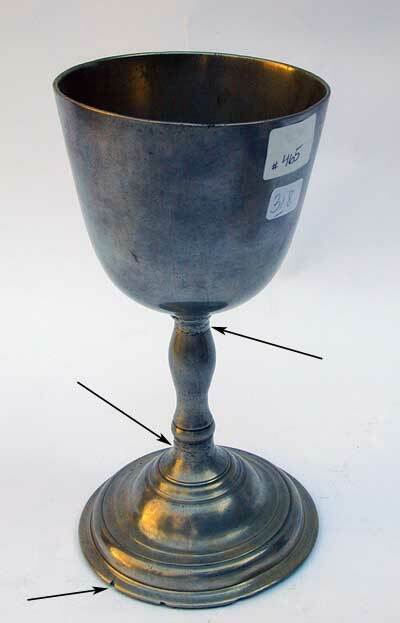 The chalice was carefully cleaned the base, cup and shaft were "straightened" to their original configuration and restoration was made to the poorly repaired areas. 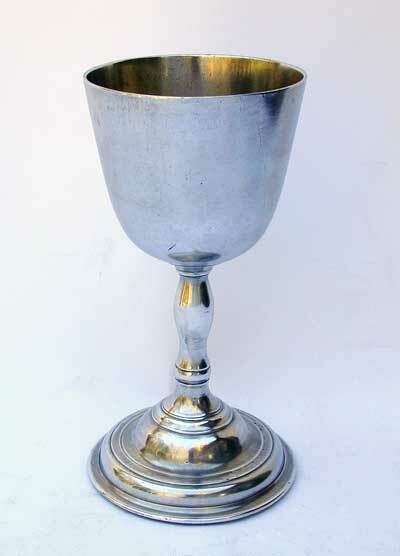 The following photo is of the chalice completely restored. The shaft has had the bad repairs ground away and metal matching the alloy of the original as closely as possible has been built up and then "taken down" to match as closely as possible the original form of the shaft. The result is a most attractive and properly preserved object. The photos record the record of this work. Note that the minor nicks and marks of wear still are present. The surface is only cleaned and hand polished. The areas of restoration are "aged" to match the surrounding areas so the restoration blends perfectly. Rates for restoration work, vary depending on severity and extent of damage. Pieces that have had previous attempts at conservation/restoration are charged a a higher rate than those that are "untouched". To correct amateurish attempts at restoration is far more difficult than working on a piece that is just damaged. Often these unskilled attempts result in distortions of the area where the repair was made. These areas are often made thin by excessive work and always result in larger repairs. In some cases this type of work leaves the piece in a state where attempting to correct the problem/s is not worth the effort. We also offer appraisal services. Wayne's experience of over 46 years in studying and 38 years of dealing in antique American and English Export pewter have given him a strong knowledge about authenticity and value in these two areas. Wayne is one of the co-authors of the Pewter Collectors' Club of America's book Collecting Antique Pewter What to Look For and What to Avoid. Many collectors have commented that they wish that other areas of collecting had such a publication as it makes the field of antique pewter more transparent. The book covers aspects of collecting including what collectors look for in an object. These include form, function, maker, and condition. In addition to this information, a substantial portion of the book is dedicated to fakes, the nemesis of all collectors. Appraisals are most frequently done for insurance purposes to provide a written description and value, along with digital photographs as a record of one's collection. Please inquire as to other types of appraisals.